Andrew Usher, known as ‘The Father of Blending’, features in a new display at The Scotch Whisky Experience in Edinburgh. Opening this week, the new display includes examples of Usher’s OVG and Green Stripe whiskies – two of his most famous creations – as well as advertising from the early 20th century and 19th-century photography. Edinburgh blending house Andrew Usher and Co was founded in 1813 by prominent Scottish brewer Andrew Usher (1785-1855), who experimented with blending whiskies in the 1840s. However, it was his son, Andrew Usher II, who perfected the skill and became known as ‘The Father of Blending’. He co-founded the North British grain distillery in 1885 and, a few years before his death in 1898, donated £100,000 to the city of Edinburgh to fund the construction of the Usher Hall, which still hosts concerts and stage productions. ‘Andrew Usher II was instrumental in bringing Scotch whisky to the world and putting Edinburgh on the map,’ said Susan Morrison, director and general manager of The Scotch Whisky Experience. The visitor attraction’s Sense of Scotland tour includes the recreation of a 19th-century Blender’s Sample Room. 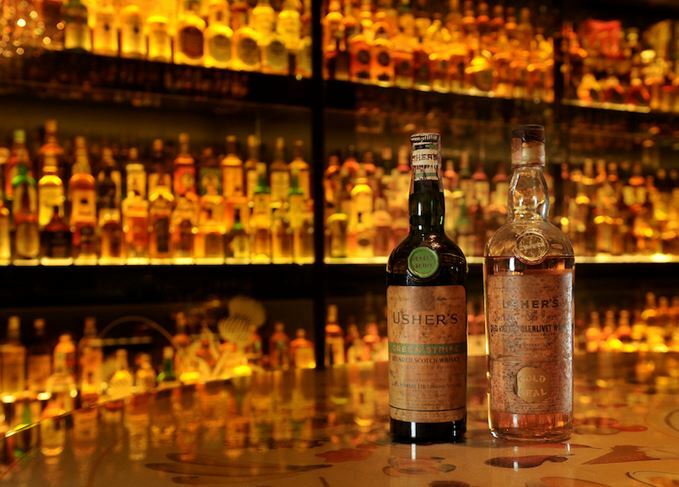 The Usher exhibit has been brought together by Diageo head archivist Christine McCafferty, with supporting materials from the company’s Global Archive in Clackmannanshire. The bottles are part of The Diageo Claive Vidiz Scotch Whisky Collection, which has been on permanent display at The Scotch Whisky Experience since 2009. The Andrew Usher exhibit will be open for a 12-month period and is part of Edinburgh 101 – a year-long project aiming to tell the history of the city in 101 objects.